Gluten-Free Living (GFL) magazine and the Celiac Disease Foundation (CDF) have a shared vision: to promote the advancement of celiac disease research and spotlight celiac and gluten-free champions in our community. With this vision in mind, GFL is proud to introduce passionate and dedicated CDF Student Ambassadors from across the U.S. Below, meet Sophie Wallack, a dedicated 13-year-old from Westwood, California, who is increasing celiac awareness while baking awesome gluten-free goodies. Celiac Disease Foundation because I want to help raise awareness of celiac disease. My younger sister and I were diagnosed with celiac disease three years ago. My sister was tested for celiac disease because she experienced frequent stomachaches. Following her diagnosis, I was also tested. I was disappointed to discover that I also had celiac disease because I had no obvious symptoms and love to eat pizza, pasta, cookies and bread. [However] I am now happily living a gluten-free life and am incredibly grateful that my sister no longer suffers from stomachaches. I became a student ambassador because I want to help fund raise for Celiac Disease Foundation (CDF). 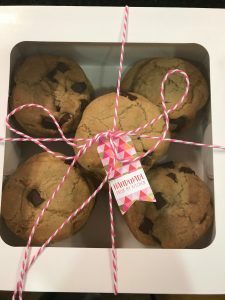 I love to bake so I created an online bakery to raise money that I hope will one day contribute to a cure. I am primarily baking for friends and family, but it feels good to do something for CDF. I also became a student ambassador because I want to help raise awareness of celiac disease. It is very frustrating when I visit a restaurant and realize the restaurant staff doesn’t know about celiac disease and can’t tell me which foods are gluten free. I love discovering new gluten-free bakeries. I recently visited San Francisco and was so happy to visit the Mariposa Baking Company. It was incredible to visit a bakery that proudly advertises itself as gluten free, and amazing to be able to order anything I wanted. When I’m not baking, I love to play golf and hang out with my friends.